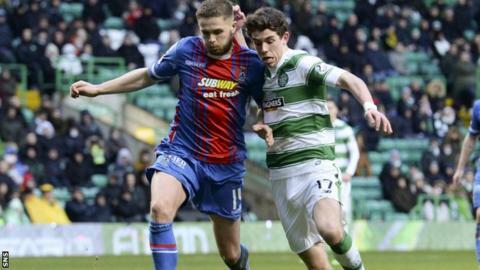 Ryan Christie concedes Celtic's sizeable posse of midfielders is going to limit his game time. Christie, 20, signed from Inverness Caledonian Thistle in September, and featured from the bench against his former side on Saturday. "Because it's such a big squad, there's so much competition, it's going to be frustrating at times," he said. "But I think over a long period, the players that keep working hard will eventually get success in the team." It is an altogether different dynamic than that which faced the midfielder in the Highlands, where he proved one of John Hughes' pivotal players. "That was one of the things I thought about when I moved," Christie told BBC Scotland. "I wasn't going to be straight into the starting 11; I had to almost start from scratch again. "But I'm delighted I've eventually started making appearances on the park." "It was very strange playing against old team mates," said Christie. "Nice to see them again and I wish them all the best in the future. I spent many good years at Inverness, but it's time to move on now. "First half, fair credit to Inverness, I think they passed the ball excellently and shocked us a bit. We regrouped a bit at half-time and showed we were definitely the better team. "I think in front of goal we were more clinical, which can prove vital in these games."